Teething Bling by SmartMom should have been invented YEARS apon YEARS ago! This is such a smart idea! I remember when my Niece Ivy was born, I was always wearing necklaces and would forget I had them on and as soon as I picked her up she would go Immediately for my necklace, She even broke one of my favorite diamond necklaces before. As much as we love our children, Grandchildren, And Nieces and Nephews..We love our jewelry too! This is why Teething bling is so perfect. You get the glitz and glam out of funky jewelry and the convince of chewable baby jewelry all-in-one! I received A sassy funky pink teething necklace on a black necklace rope, The pink circle is made out of a harder plastic, But not so hard to hurt babys gums. It's so cute you can wear this as everyday, at the office, or special occations. How perfect is that?..And it's on rope so baby can pull and tug as much as they want and it won't break! TeethingBling is made from fine quality materials. As with any adult jewelry, Unsupervised handling by children is not recommended. Their products are made from a silicone that is phthalate and lead free, non-toxic, dishwater's-safe and federally approved. So even the most worry wort mommies can worry a little less. The girls at Teething Bling also sent me a aquamarine teething bracelet, Its bright colors are perfect for spring and summer colors, you can wear one or buy more then one and wear them together to be stylish and keep baby busy at the same time. The teething bracelet is thick so no matter how much chewing baby does it's not going anywhere. This bracelet is easy to slip on and off so no pulling or arm hair pulling. ouchies! With all the asorted colors, styles, and shapes of teething bling you are sure to find something that you can't live withought They even having TeethingBling For dads and Grandads! With their stylish and versitile ties!! 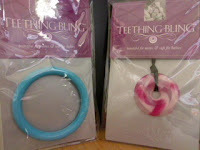 you won't want to live withought teething bling again!